Similar problem. When updating the BIOS, the installation is interrupted with the error " WARNING !! ROM file information does not match system BIOS". How to solve this problem? Wait for the developers to fix the error? Developers reading this forum? Same problem here. Just downloaded from APP SHOP and it is telling me that "ROM file information does not match system BIOS", followed by a freakish "Want to continue...?" question. Anyone from AsRock reading these? Can you at least acknowledge the problem if not provide a fix quickly? I will pass this along to Tech Support. Thanks for sharing the info guys. Thanks Xaltar, just in case this helps, I'm using AsRock Z270 Killer SLI/AC motherboard. APP SHOP says that my current BIOS version is 1.0 and the one it downloads is 3.3. 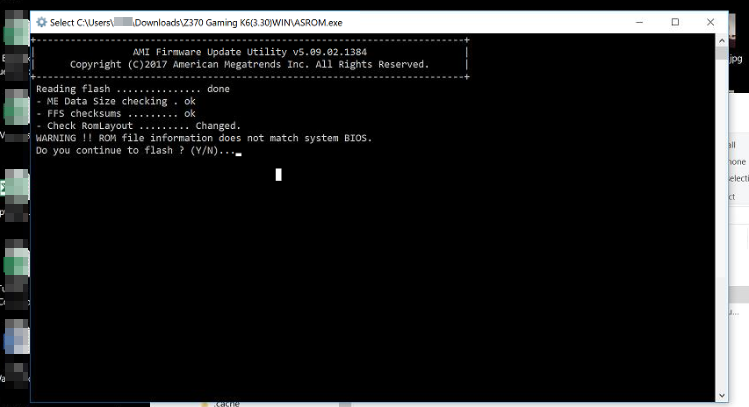 Interestingly, if I go to the [URL=https://www.asrock.com/mb/Intel/Z270%20Killer%20SLIac/index.asp#BIOS]official page[/URL] of Z270 Killer, the latest BIOS version listed there is 2.3. This gives me an indication that APP SHOP is most probably not detecting my motherboard correctly (or else the official page is outdated). OK, so I have reached out to my contacts at ASRock and they have gotten back to me about this issue. They apologize for any inconvenience this has caused and say that you can go ahead and press "Y" to continue the update. In essence, you can ignore the message. They also assured me that the issue will be resolved in the next update which should be along soon. So if you are uncomfortable ignoring a warning you can just wait for the next update. These forums exist so users can help each other out and I do my best to help users wherever possible, be it using my own experience or passing things along to my contacts at ASRock. These forums are a valuable resource to allow users to post their experiences with ASRock products and for ASRock to learn what their users want out of their products. Thanks for your help with this issue Xaltar. Also get "ROM file information does not match system BIOS" on my z370 Extreme4, version 3.1 to 3.3. When I read "do you want to continue?" my mind says "do you want to potentially brick your PC?" I'm not a gambling man. Hopefully they get around to fixing this and there should never be a continue option in release builds, if validation fails it fails, it's poor programming practice. Just a minor correction. I incorrectly posted above that I had Z270 motherboard. I actually have Z370 Killer SLI/AC. Not sure how it affect other things that I mentioned there. Anyway, I do get the error msg and "want to continue?..." question.